The MSI Wind 12 U230 netbook has a lot to like, but its battery life - 3hrs, 48 mins in our tests - is a dealbreaker. The average battery life for netbooks is about 7hrs. It's unfortunate, considering the Wind12 U230's strong general performance and portable design. But being mobile means not being tethered to a power outlet; and in the configuration we tested, the Wind12 U230 lacked staying power. The MSI Wind12 U230 netbook uses the often overlooked AMD Athlon Neo X2 dual core processor which is a great performer when compared to the Intel Atom 330 without sacrificing too much battery life. MSI has a great implementation of this AMD processor in the U230 and is deserving of the LR Innovation Award for stepping outside of the Intel Atom comfort zone so many netbook manufacturers are in! We're big fans of netbooks, but we're bigger fans of more -- more power, more convenience, more value. That makes us fans of the Wind12 U230, which has few direct competitors -- Lenovo's IdeaPad S12, for example, is a 12-inch-screened netbook that starts at $399, but its comparably equipped version (with 2GB, a 250GB hard disk, and Ion graphics) is a pricey $599. If this is where netbooks are headed then this is a good thing. The Wind12 is priced not much higher than some other Atom based netbooks out there but it’s much more powerful making it more useful overall. 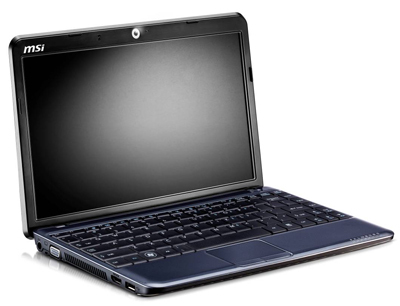 The Wind12 US230 is a great choice if you’re looking for a new netbook, it offers the portability of a netbook but the power of a notebook in the same form factor. The Wind12 is nicely made and it seems durable. The battery life is a bit short, but that’s expected for most netbooks out there today. The keyboard is nice and large, the keys are about the size of a desktop keyboard so you’ll be typing easily on it. AMD's Congo platform is what Yukon should have been. Offering dual-core CPU performance that's better matched against Intel's ultra-low-voltage Core 2 Duo parts, the platform makes for an interesting argument when priced between Intel's Atom-powered netbooks and CULV-powered notebooks. GPU performance is good thanks to the introduction of ATI Mobility Radeon HD 3200-series graphics. Though, good is a relative term, as 3D gaming remains suited to just basic, casual use. 70% MSI har produceret en let, lille computer, der kører langt på literen, men den larmer.